I've been following the food and career of chef Sofia Smith for a long time. More than a decade ago, I enjoyed the cakes and salads at her long-since-departed Angel Café. 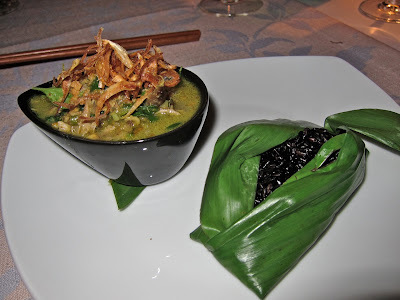 Almost half a decade ago, I loved Smith's Asian fusion menu at the restaurant, Angel. I wished that eatery lasted longer than it did. Its location has been cursed for its many tenants. I never actually met Smith until early 2011 when I got to know some of the staff at the much-lauded and very successful Asian-fusion restaurant, Sansho. When it opened, Smith was one of the cooks working under former Nobu London sous-chef, Paul Day. Earlier this year, Smith got a kitchen of her own at Le Patio. It's the same location as Resto Cafe Patio, which I liked quite a lot. She's turned it into showcase for her own Asian fusion menu, though there are a number of similarities to Sansho's offerings. The front dining room of Le Patio is basically unchanged. That's the smoking area. The second floor overlooking it is the non-smoking section. 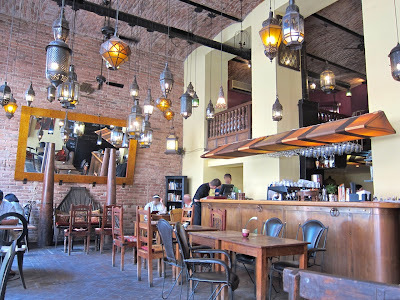 There's also a section that used to be a furniture shop that has converted for use as restaurant space. I stopped in a couple of times for lunch. I started off with a beer. They have .33 liter bottles of Pilsner Urquell (60 CZK). The price is steep by Prague standards. I ordered two dishes from the "small plates" section of the menu. First up was the sweet calamari (165 CZK). The squid were fresh and tender, though cooked slightly longer than I'd like. It's mixed together with fresh baby spinach. It sits on a crispy wonton-like base. What grabs your attention is the homemade, caramelized chili sauce. After you get past the sweetness (and not everyone will), you taste lime leaf along with black and white sesame praline mixed in. There's a slow-building but serious spiciness. I wished it was bigger, but I liked it. The second plate was the hot and sour beef salad (185 CZK). Thinly slice beef, cooked medium but served cool, was tossed with pomelo, peanuts, green onion, toasted rice, galangal, and nahm jim, a chili and lime dressing. The meat was not very tender, but had great flavor. I detected fish sauce, coriander, and Thai basil. It also deserved to be in the "small" section. Then there was dessert. It was what the menu called "love it or hate it" black rice pudding with vanilla and coconut semifreddo (95 CZK). 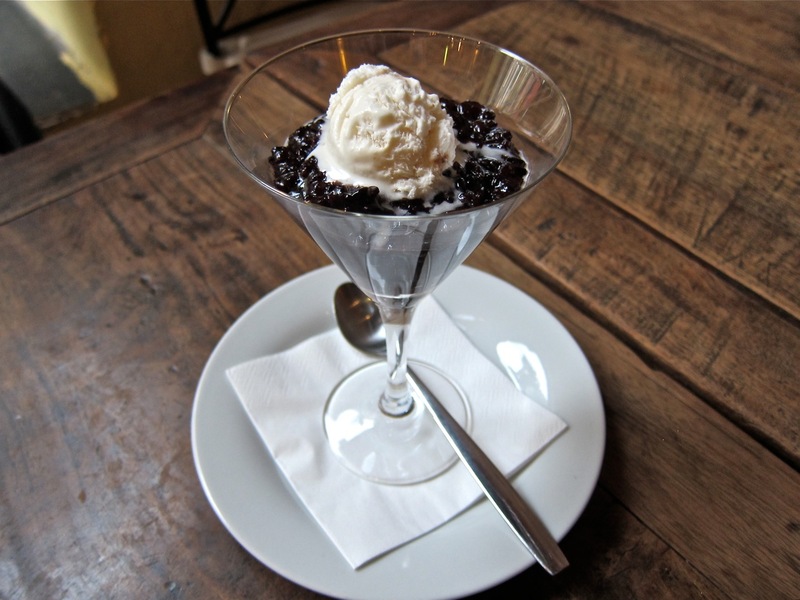 The creamy coconut melted into the warm, al dente rice. It creates flavors and textures that are both familiar and new. I hate being boxed in, so I'm going to go with "liked it." The tab for this lunch was 505 CZK. Service was OK. I began the next lunch with the gado gado (175 CZK). 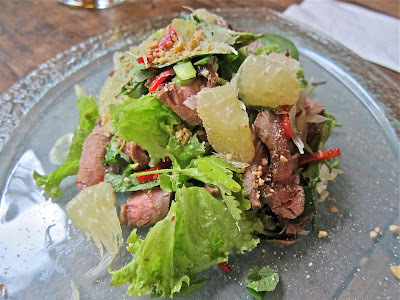 I've had many versions of this Indonesian salad in Netherlands, the USA, and even in Prague. 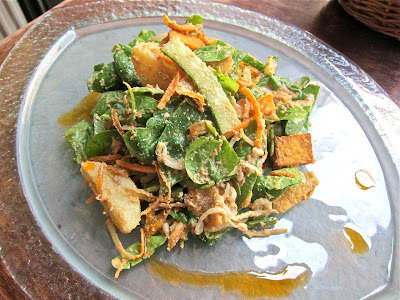 Spinach is tossed with a peanut dressing, shredded carrots, warm crispy tofu, cassava crisps, and potato slices. There was a growing heat with each bite, but I found it bland, especially the potatoes. Adding a generous amount of salt brought improvement. There's no single recipe for this, but all others I've had included boiled, sliced egg, which this one omitted. The menu lists "Le Patio Prawns - 3 ways." At first I thought all three kinds came together, but you actually pick which of the three you want. 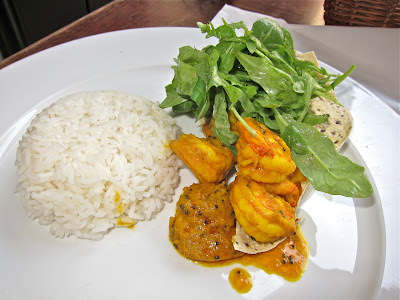 I tried the Balchao prawns (185 CZK). Six small crustaceans were served cool, with a small portion of rice, papadums, and salad. 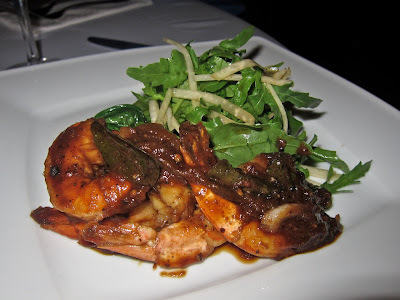 The prawns were on the chewy side with mild heat and the flavor of curry and mustard seed. I wasn't impressed. 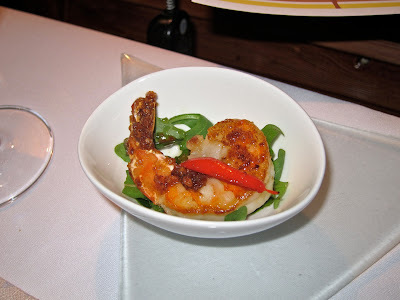 At a later dinner, I preferred the fiery black pepper prawns (185 CZK). Those are stir-fried in oyster sauce with soy, black vinegar, garlic, a generous amount of black pepper, and kohlrabi. Very spicy. This lunch cost me 460 CZK. The kitchen moved slowly, and I waited a fair amount of time between the courses. The restaurant was not very busy, but it took too long to get my bill and pay. The similarity between Le Patio and Sansho is they both have tasting menus. 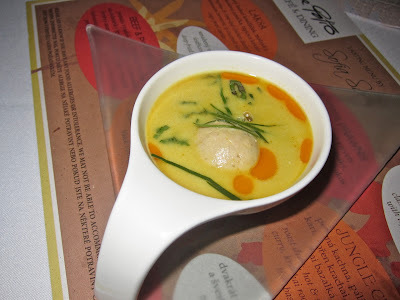 Le Patio's is eight dishes for 850 CZK. The ones I enjoyed at Sansho last year were seven courses for 750 CZK. Smith does dishes like jungle curry, soft shell crab, and sticky toffee pudding (which is a signature dish of hers) on her degustation. Those items, although done differently, are also on Sansho's list. 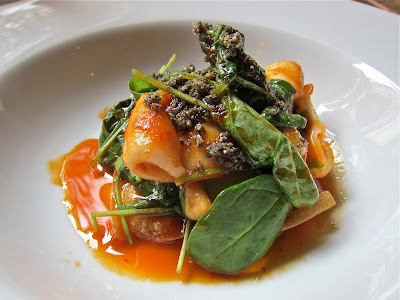 I tried Le Patio's tasting menu a few weeks after it opened. Overall, I didn't like it. A couple of dishes were far too salty. One was bland. A salad, which has since left the menu, was dull and underdressed. One night not long afterward, I randomly ran into Smith at Zebra Asian Noodle Bar. She told me her kitchen was being reconstructed and a lot of staff was turning over. I decided to try the menu again in September. I returned with several out of town visitors. Two of us had the tasting menu. The other three ordered a la carte. We were warned that the tasting would take at least two hours. This did create some awkard periods when the a la carte crowd had no food in front of them. For simplicity's sake, I'll just cover the tasting menu. Although I was able to sneak into the lunches unnoticed, Sofia Smith was out in the dining room and spotted me right after we sat down for dinner. We started with a bottle of La Baraquette No. 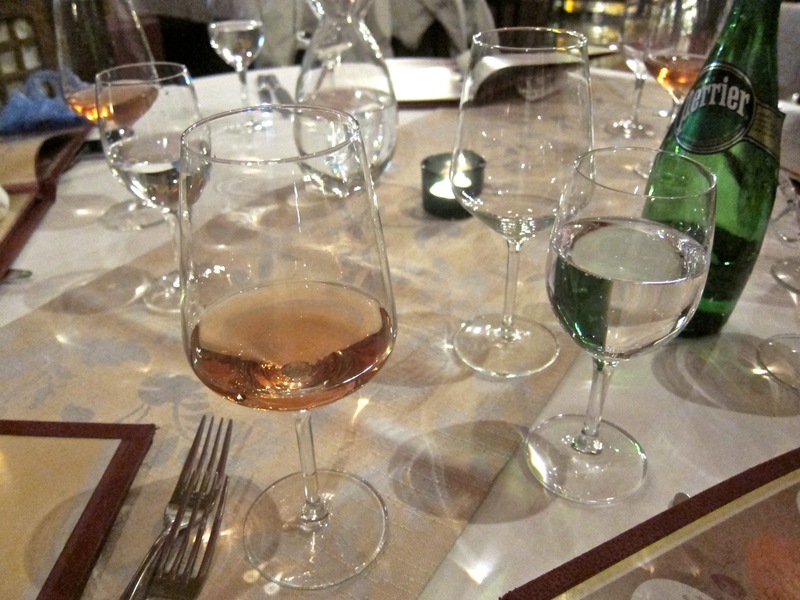 3, a Languedoc rosé. It was light and dry. Everyone liked it. We also had a big bottle of Perrier (130 CZK). A basket arrived with homemade rolls. Years ago, I had these at Angel when they were fresh from the oven. These were cold and chewier. There was a chili jam on the side made with dried shrimp, brown sugar, rice wine, shallots, coriander, and red chilies. Based on the ingredients our waiter described to us, we expected it to be sweet and spicy. However, it was more salty and fishy. The flavor took some getting used to. It grew on me, but not everyone liked it. 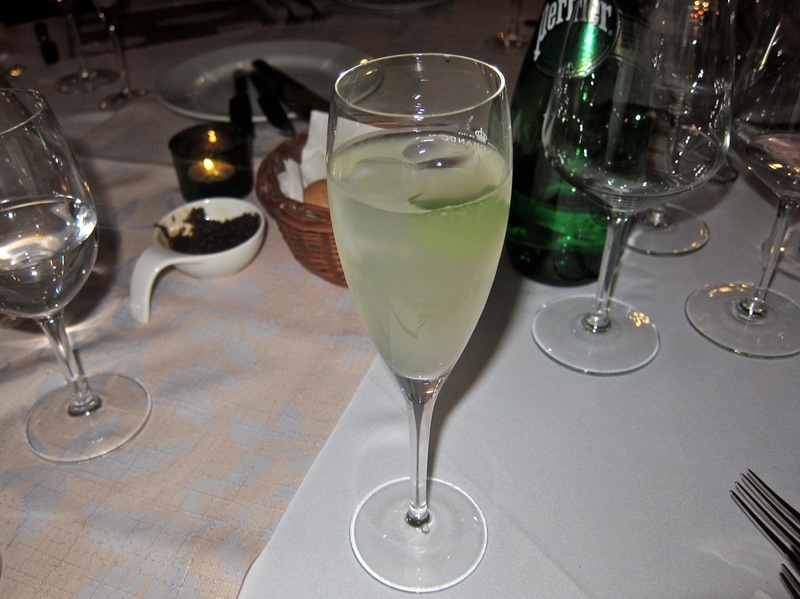 I was served a drink that I was told was a palate cleanser to sip between courses. This was iced white tea with lime, ginger and mint. At first I thought the flavors rather weak. 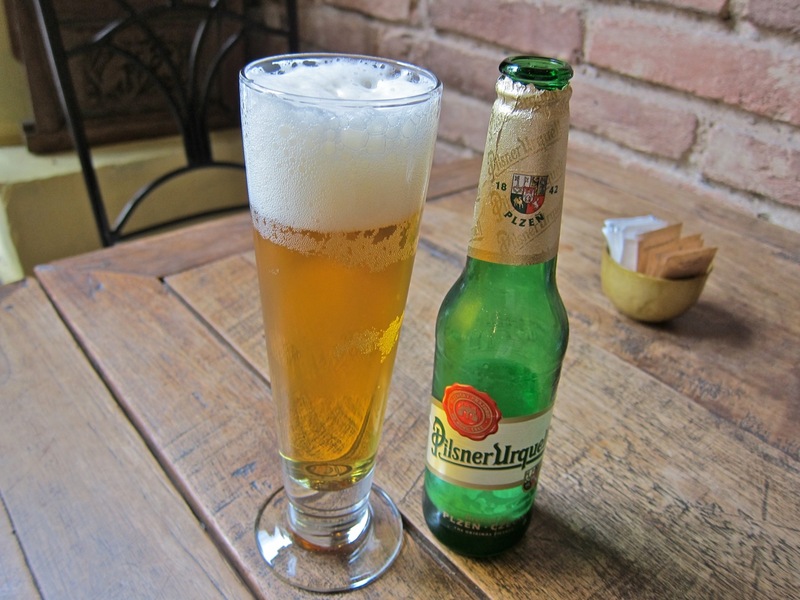 Later on, I did find it more refreshing and relied on it to reset my taste buds through the meal. 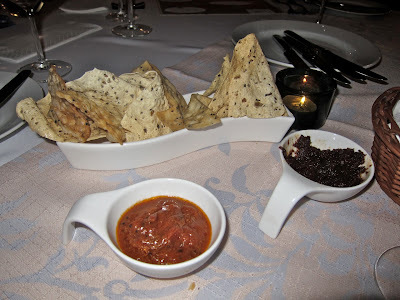 We also had papadums with a lemongrass, coriander tomato dipping sauce. There was a little sugar, a little spicy, and it was quite nice. Course 1: Beef and Pineapple. 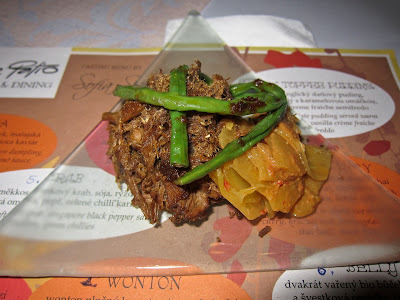 This was dried shredded organic beef, fresh pineapple, rojak dressing, and snake beans. The first time I had it, the dish was served at room temperature. This time, the tender, shredded, long-cooked meat was warmer and much more inviting. It had the luscious flavors of cardamom and cinnamon. The thinly-slice pineapple with the rojak had a big kick. There was also lime leaf in there. It had a terrific balance of salty and sweet. Course 2: Wonton. 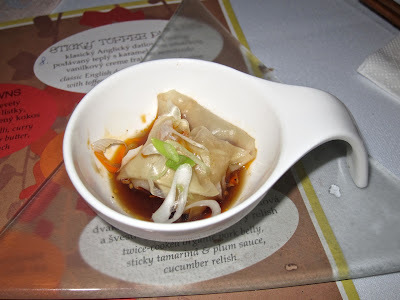 It's a steamed Szechuan-style shrimp wonton with chili oil. This is eaten in one fiery, vinegary bite. It was a well-made dumpling. The flavor of the black vinaigrette dominates. Course 3: Laksa. In basically a large, deep spoon, there's Malaysian coconut soup, a lemongrass and lime leaf chicken dumpling, and masago caviar. The broth, with a touch of sweetness, was delicious. However, I did not like the dumpling. It was a densely packed ball that had an unenjoyable, crumbly texture when chewed. The same dumplings are also in the otherwise enjoyable coconut and galangal soup. Course 4: Butter Prawns. This is a picture from the first tasting. At the second, I received two. These are wok-fried with red chillies, curry leaves, garlic, rice wine, and rocket leaves. The toasted coconut on top, made with caramelized brown sugar, give it a crunchy, sticky sweetness. Miss P gave it a thumbs up. It was also my favorite of the three shrimp offerings on the menu. Course 5: Crab. 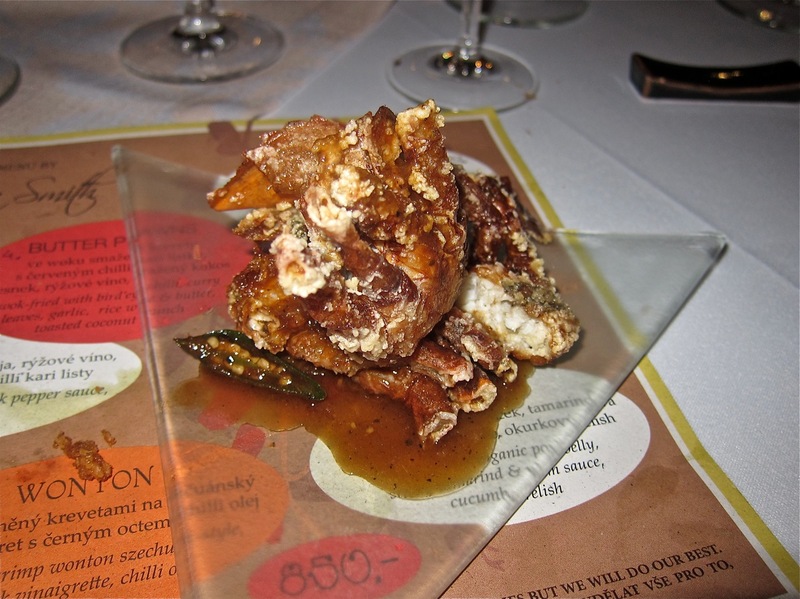 A soft-shell crab is deep-fried and lightly coated with a Singapore black pepper sauce with green chillies. This was way too salty the first time, but just right on the second try. It was perfectly, delicately fried. Course 6: Belly. This is twice-cooked organic pork belly, with tamarind plum sauce and a cucumber relish. The dish was great the first time and great the second time. It was hot and cool, salty and sweet, with tender pork surrounded by crispy, rendered fat. Course 7: Jungle Curry. The is a photo from the first visit. On the second, the black rice did not come in the banana leaf. This dish was also excellent both times. There was a bouquet of flavors -- ginger, Thai basil, lemon grass, fingerroot, and crispy garlic. The small pieces of duck were very tender. Jungle curry recipes are from northern Thailand and don't use coconut milk. 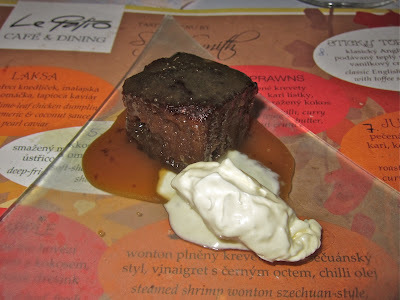 Course 8: Sticky toffee pudding. The menu calls it "a classic English date pudding served warm with toffee sauce" and a vanilla bean crème fraiche semifreddo. I loved this at Angel, Sansho, and now at Le Patio. So I went from not liking this tasting menu to really enjoying it. Miss P felt the same. Will you? It's hard to say. 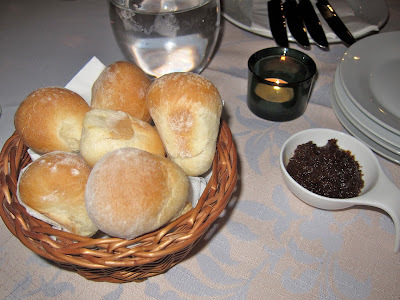 We all felt we received special treatment because I was recognized at the beginning of the meal. Our service was excellent. The sommelier was our waiter. Because of this, I'm not going to count this last visit as part of the service rating. I want to know how guests are treated when they are not writing about the restaurant. I did get a taste of that on earlier visits. Although I wasn't impressed with all my experiences there, Le Patio is capable of great things. I hope they do it for everyone. I preferred the previous chef. 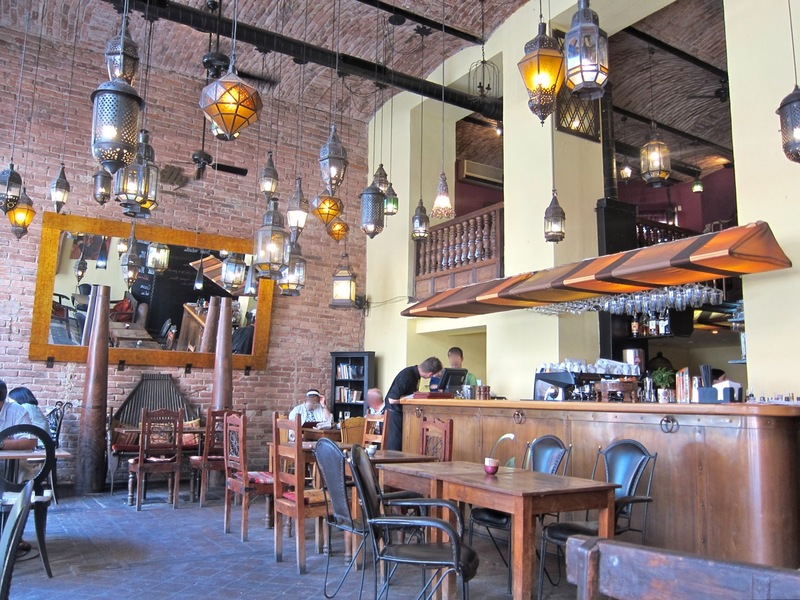 I was living in Prague till 2 years ago and Le Patio was one of my favorite spots, discovered thanks to your post. I was in Prague earlier this year and went there and I was disappointed. My 2 cents.